While warehouse safety is practiced in the warehouse, it is learned and enforced from the top down. Injuries resulting from improper materials handling. “Creating a safe work environment requires a good deal of effort, but it brings benefits to both workers and management,” says Gary Gagliardi, vice president of Safety Resources, a safety consulting firm located in Indianapolis. “Companies need a culture of safety,” says Gagliardi. Warehouse operators should establish safety best practices, as well as provide worker training to enforce those practices. One way to ensure this is being done is to form a safety committee, comprised of warehouse workers, shift supervisors, and management. This approach also ensures that everyone has a voice in the process. For smaller companies that cannot easily support a safety committee, Shaunnessey recommends regular warehouse safety meetings. 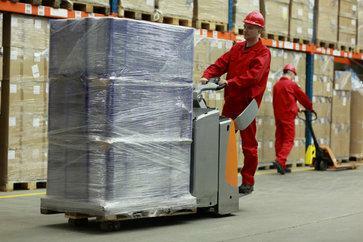 Another way to minimize warehouse accidents is to give your employees the tools they need to perform their jobs in the most efficient (and safe) way possible. This means better materials handling equipment. This means partnering with S.W. Betz. We have been providing businesses in Baltimore and beyond with all of their essential Weighing, Materials Handling, Dock, and Warehouse equipment since 1933. If you want to learn more about Materials Handling or Warehouse Safety, please contact S.W. Betz by calling 410-574-1414 or 800-332-0322 today! You can count on the S.W. Betz Company to work with you and provide you with our extensive knowledge of the industry. This entry was posted on Tuesday, July 28th, 2015 at 4:01 pm. Both comments and pings are currently closed.